Chinese investors are setting their sights on trophy assets in the West, and soccer teams look like fair game. The case of English football club Birmingham City, whose main shareholder and former president just sold a stake to an obscure Chinese company, offers a cautionary tale. Big personalities make risky shareholders, but China brings extra anxieties. Birmingham had already experienced the rise and fall of a wealthy patron. Hong Kong hairdresser-turned-businessman Carson Yeung led a buyout of the soccer group between 2007 and 2009. But after facing money laundering charges, he stepped down as chairman of the listed holding company on Feb. 4. On Feb. 12 the indebted Birmingham International Holdings said it was selling a 12 percent share in its UK subsidiary for HK$45 million ($5.8 million). The cash is welcome – Birmingham’s parent turned loss-making following the club’s relegation from the Premier League in 2011. But the buyer is mysterious. Beijing Liangzhu International Media and Advertising Company is listed by a Chinese local government company registration website as a “design, manufacturing and advertising” company, founded in 2005 with capital equivalent to just $250,000. Beijing Liangzhu will get two seats on the club’s existing four member board as part of the deal. Its influence may grow more if plans to sell a 24 percent stake are followed through. China is flush with cash, but capital controls and opaque legal systems make it hard to follow the money trail. That might explain why Birmingham’s holding group has demanded a 22 percent deposit from Beijing Liangzhu. Insurer American International Group agreed to sell its aircraft leasing business to a Chinese consortium, only to find payment hadn’t come a year later. It eventually found a Dutch buyer, Aercap, in December. Chinese investors have been circling everything from property development projects in the United Kingdom to Forbes Magazine and the New York Times. Those with deep pockets can make welcome owners of financially fragile assets, and more cash-strapped companies will find that China provides welcome liquidity. The cost may be that the targets know less than they’d like about who’s watching over them from the stands. 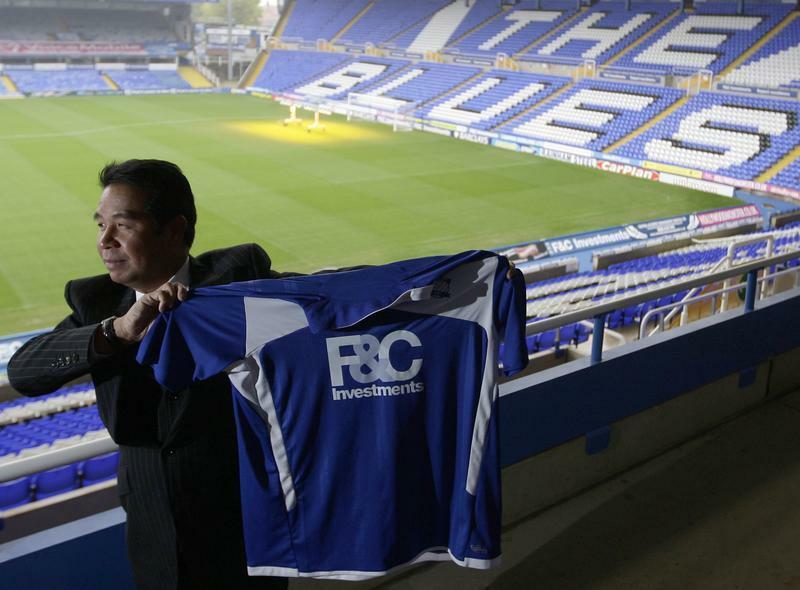 Birmingham City owner Carson Yeung poses with a shirt during a news conference at St Andrew's in Birmingham, central England October 15, 2009. Hong Kong-listed Birmingham International Holdings (BIHL) agreed on Feb. 12 to sell a 12 percent stake in Birmingham City Football Club to a Chinese investor, valuing the club at HK$375 million ($48 million). The purchaser’s Chinese name translates as Beijing Liangzhu International Media and Advertising Company. The company was listed by the Beijing Administration for Industry and Commerce as a design, manufacturing and advertising company founded in 2005. BIHL had announced on Jan. 17 that it was in discussions to sell up to 24 percent of the football club. Beijing Liangzhu will receive two seats on the four member board of the football club as part of the deal, BIHL said in a company filing. BIHL shares rose 26 percent to HK$0.21 on Feb. 13. The stock only resumed trading on the Hong Kong stock exchange on Feb. 7 after a two and a half year suspension. Largest shareholder Carson Yeung resigned as chairman of BIHL on Feb. 4. He has pleaded not guilty to five charges of money laundering. A verdict is due on Feb. 28. Birmingham City won the English League Cup in 2011 but were relegated from the Premier League to the second-tier Championship in the same season.